Being Swedish, the town Mora more or less equates to knives and I would even go so far as to claim that “Mora” is pretty much a synonym for the word “knife”, here in Sweden, much like Wellingtons are a synonym for rubber boots in the UK. Say the word, and people will inevitably see a red-handled knife before them. Cheap, reliable, if you respect it, and very sharp, it is an icon ever since the 19th century, deeply embedded into the soul of Swedish culture. And over the last decade or so, the rest of the world has begun to see the greatness and charm of these knives too. The Mora cutlery history goes a long way back. While the typical design is rooted in old Scandinavian customs going back many centuries all the way to the Viking period, the town of Mora saw many clock makers switching to the art of knife making in the 19th century as they were outcompeted by American clocks, and thus the Mora knife was born. Advertisement for Frosts from the 1930s. Well used Moras below a new one of original design and colour. 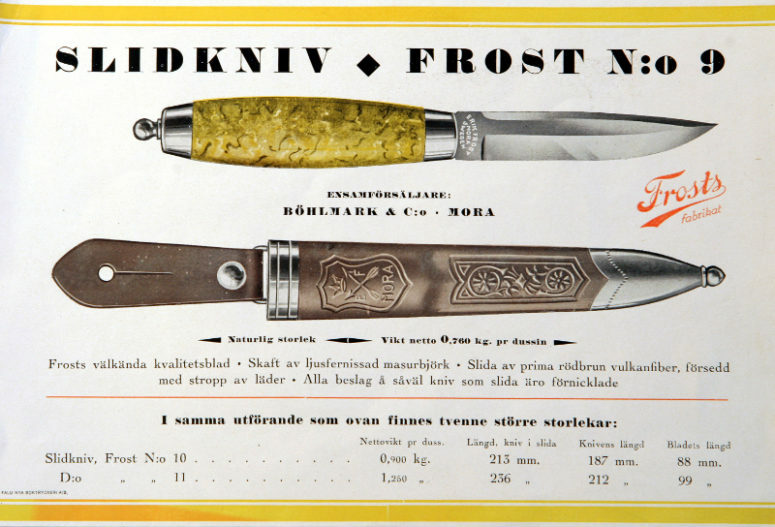 Frosts was one of the first proper knife factories in Mora and has manufactured knives professionally ever since the late 1800s. Others followed suit and with time joined together. The Mora Knives company today is made up of several old mora knife companies including the old cutler names of Frosts, F.M Mattsson, K.J. Eriksson and AB Carl Andersson. Mora knives with all these brand names are still easily found both new and antique. For most Swedes, these knives were commonly, and per old custom, well cared for, sharpened and used up until they could no longer be used, and then and only then, replaced with a new knife. For most men these were about as common items as a pair of pants or shoes and they were one of the few possessions you with a fair degree of certainty could count on all households having in the tool shack or garage. Few, if any, foreign brands were even sold before online shops made it easy to order from abroad and I myself didn’t even have a non-Swedish knife up until just a decade or so ago, despite being, shall we say, above average interested in knives. 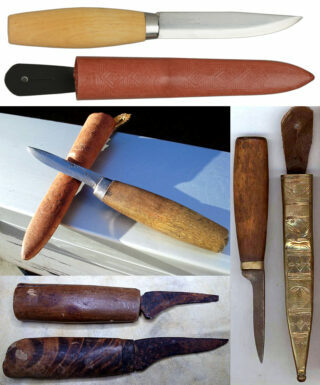 As a result of all this, the Mora knife has been quite integral to Swedish, and male life in particular, being used for carpenting, household fixes, fishing, hunting, military service and more. It was the one universal tool everyone used and relied on. Or as this old gentleman expressed it, when asked by a Swedish newspaper not long ago. 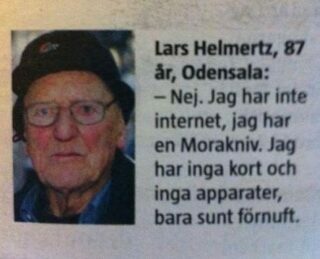 -Lars Helmertz, 87 years, Odensala. You simply don’t need much more in life. With that, let’s turn to looking a bit at some of the old knives of Mora. While, as already described, being deeply rooted in centuries old tradition, the Mora Knives company has also constantly aimed to both follow current trends and to continue to improve and expand on their knife designs. Over the years dozens of different models have been manufactured, with the most classic being the red-painted birch handled knife of classic Scandi design, today called the Mora Classic. 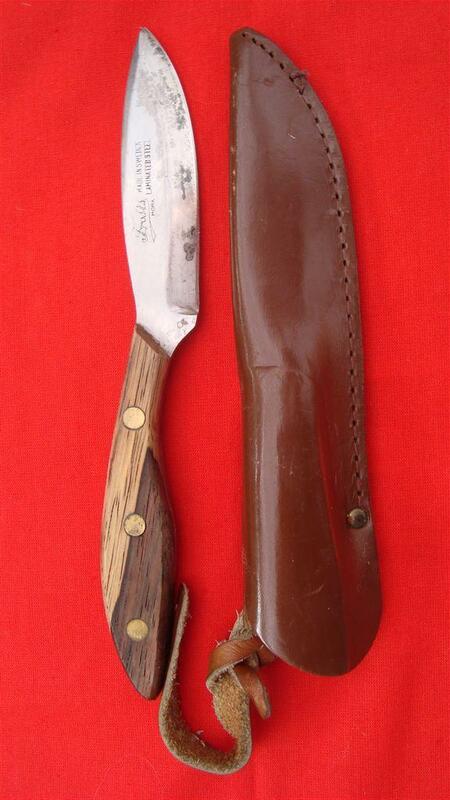 For a great many years this was also the standard utility knife for the Swedish armed forces, for regular grunts as well as medics and pilots alike. Basically all men in Sweden had experience in using them, without exception, all the way up until the late 1990s when the conscript army was disbanded. My original Frosts Lapplander 115s, cryotreated steel with full tang, rosewood handles and brass fittings. Through the past decades special hunting knives like the iconic Frosts Lapplander 75, 90, 95 and 115 models have been presented. These in particular have been very popular among outdoors people and are today highly sought after semi-rarities, selling at quite high prices. 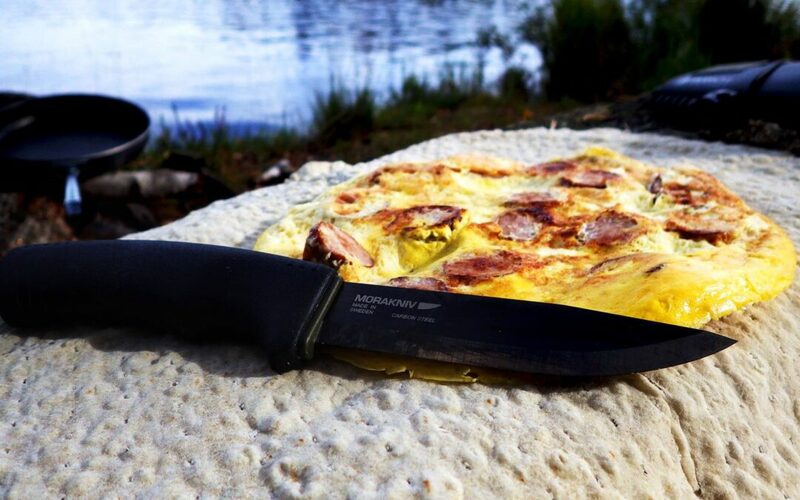 The Lapplander 95 design is also still manufactured and sold by the Mora Knives company. My old Mora “Yukon” skinning knife. More rare, the 70’s Canadian Belt Knife design, originally designed by Grohmann, has also been made in Mora version, and in the late 80’s the quite modern looking K.J. 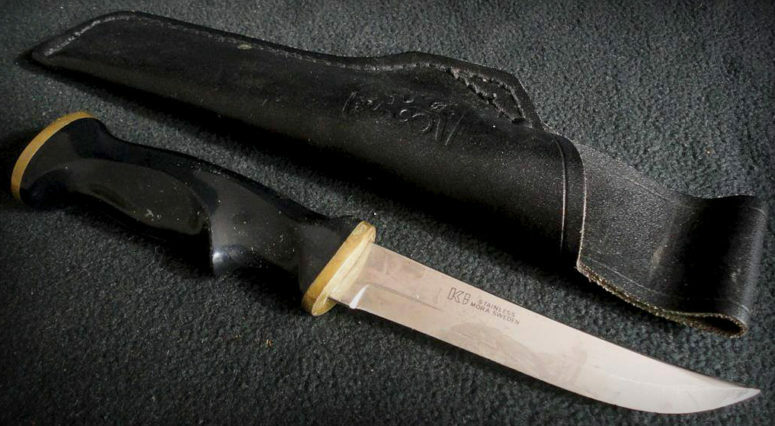 Eriksson Jägaren (The Hunter) knife, seen above, with a distinctly shaped, black ergonomic grip was released, but it has since been discontinued. I was quite happy to carry one during my military service though. Likewise, special knives designed specifically for children and young scouts have been designed as basically just smaller, but just as sharp, Mora knives, with an added finger guard, and have been very, very popular as a first knife for kids. Coming up to the current times, a wee bit more than a decade ago, Mora released a new knife aimed at outdoors people, hunters and fishers called Mora 2000. This knife has grown to become very popular, despite, or perhaps due to its, for Mora, very unconvential blade geometry, deviating from the edge and blade geometry Mora has stuck with ever since its beginning. This blade is also used on the Mora Forest knife, but then with the same grip as the Mora Bushcraft Survival knife. To some degree following this trend, and intentionally targeting the booming bushcraft / prepping / survivalist / tactical markets, the Mora Knives company has in the last few years reinvented itself quite a bit, with an impressive explosion of energy, releasing a good number of new knife designs. Today’s knife belongs to this particular group of new generation Mora knives. So, having looked at the history and lineage of Mora knives, seeing a bit where it comes from, let’s finally turn to the knife we are reviewing today: the Mora Bushcraft Survival knife. To begin with, the knife is substantially beefier than traditional Mora knives, with a 3.2mm blade, compared to the 2mm of the Classic 1. It comes in two versions, with only the colour and the steel differing between them. The orange version is made from Sandvik 12C27 stainless steel which is very popular in Sweden and parts of Northern Europe, while the black version is made from high carbon steel, which is far more popular in the US and Finland. High carbon steel can be harder and can therefore retain an edge better, but this is mostly only true for cheaper knives and edge geometry as well as hardening of the blade are equally important factors. With these Mora knives, the stainless steel blades are hardened to about HRC 56-58 with the high carbon blades hardened a bit more; to HRC 58-60. The high carbon variant has a blade blackened with Tungsten DLC coating, to help prevent rusting, and this may also appeal to those with a preference for tactical designs. Note though that there is a significant difference in weight, where the stainless version weighs 58gr/2.1oz more. Proportions and other data are identical between the two, and both sheaths come with integrated diamond sharpener and a good, solid Swedish Army type firesteel. 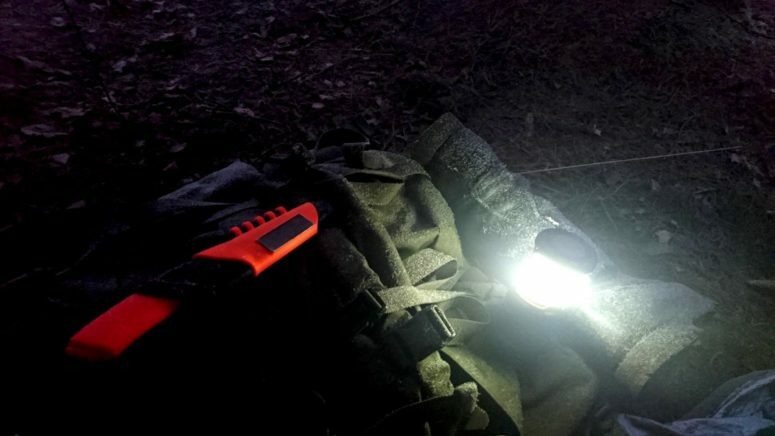 The sheaths also come both with a clip and a full loop, both capable of rotating 360 degrees on the sheath, which is quite practical, for example when sitting down, outdoors or in a vehicle. The blades are both Scandi grind at about 23-25 angle and have a square spine suitable for scraping the firesteel with. Both of these blades work well for this, in contrast to the commonly held misbelief that stainless doesn’t work with firesteel. (With fire rods the sparks come off of the rods, not the knife. With flint however, the sparks come off the knife, and high carbon steel is needed then). Mora knives are per tradition not truly full tang, but with the Mora Bushcraft Survival it is certainly not a rat tail either, instead using a long partial tang, which makes the knife more robust and durable even for more demanding chores like batoning. As always with Scandi grind knives like the Mora’s, they are wicked sharp, although due to the somewhat thicker blades, when compared to the Classic, they are not quite as fantastic for carving. Still, there is plenty of carving ability in this knife. And cutting rope, meat, gutting fish, chopping or slicing vegetables etc is a breeze. The steel and hardening is good and the blades retain their edges well, while still being quite easy to sharpen. The quality and thickness of the blade makes it, perhaps a bit surprisingly, great for batoning, as it is durable yet not too thick for batoning. Still, batoning is not a typical Scandinavian custom and I prefer an axe for splitting wood. For a survival knife it is a requirement though and it does perform excellently in this respect. Looking at the square spine of the blade, it is quite clear however that the intended purpose for this knife has far more to do with survival and quick chores rather than extended bushcrafting and carving, as the square spine soon becomes uncomfortable if you press your thumb against it when carving. This is not really an issue, as most chores when outdoors are indeed quick ones, but if you intend to do a lot of carving, then another knife with a rounded spine is more suitable, like the Classic. 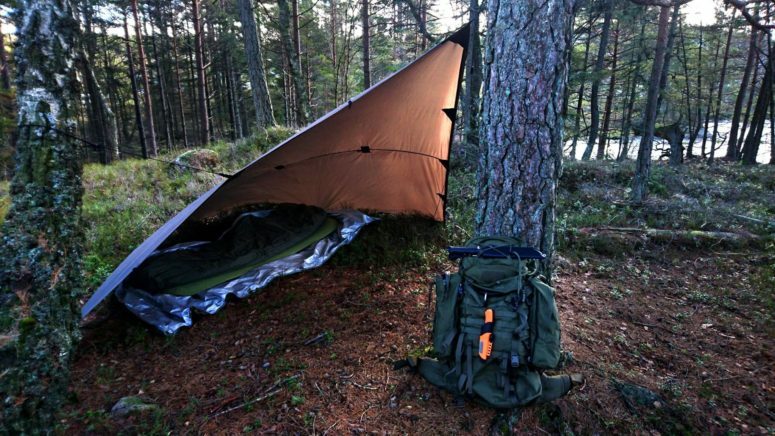 Winter camping with the Bushcraft Survival. The orange grip and sheath really pops. The rubber grip is extremely comfortable and feels quite secure even when wet and grimy. It can be used quite comfortably in any thinkable grip; reversed, side grip, thumbing the spine or flat etc, etc. As usual with Scandinavian knives, the tang is completely covered by the grip, which is good for sub zero temperatures as bare skin and cold steel is a bad combination. The lack of a hole for a lanyard may disturb some, but it has never really been a common practice in Scandinavia. The plastic sheath, like all Mora sheaths, is simplistic but quite functional and more than satisfactory. The integrated diamond sharpener works quite well, if a bit coarse, while the sturdy Swedish Army style firesteel is quite effective and thick enough to last you quite some time. In fact I, and apparently quite a few others too, would be very happy if Mora Knives would offer these fire rods for sale on their own, as they are really very, very good. The holder for the firesteel grips it well and locks it in place with a distinct “click”, just as the knife itself is, even in inverted position. This, a surprising number of manufacturers fail with, but with this sheath everything is tight and secure, even if there is a little bit of rattling if you shake it. The grip of the firesteel also has a lanyard hole to secure it when the firesteel is worn down enough for the holder to not secure it properly. The orange colour, while perhaps not cool, is very functional in that you won’t easily lose the knife or even sight of it, as it really pops out in the greenery and bush, as can be seen in the pictures. For regular outdoors people this is great and much preferred to the camo or brown, olive & black sheaths so common with other makers. All in all, this is a very good and solid survival knife well in line with the old Scandinavian knife traditions and it will serve you well if you treat it with proper respect and understanding for these traditions. Being Swedish and living near the ocean where the air will cause high carbon blades to rust just lying on a shelf, I prefer the hassle free stainless steel over high carbon steel, but those coming from other backgrounds may well prefer the opposite. I do wish, however, that both knives would be offered with an option to choose between orange or black grip and sheath colour. At least sheath colour should be available for choosing. Orange Bushcraft Survival shines almost as bright as the lantern in the quickly fading winter light. The knife itself is pretty much flawless as it is, and considering what use and target group it is designed for. I really don’t have anything negative to say about it, nor any suggestions on how to improve it. But, while the sheath is quite fine as it is, I would like to see the sharpener moved up just a little bit, as when sharpening, I prefer to keep the knife static and move the sharpener instead of vice versa. I find this both more practical and also a lot safer with such small sharpeners. With the current placement it doesn’t work quite as easily as it could have. This is a very personal preference though, and will probably not bother most. A detachable sharpener would also be neat, but I understand that it would make things more complex and expensive. While there are ridges on the sheath, designed to make it easier to pull the knife with one hand, it doesn’t really work and instead you have to press against the edge of the sheat. It would have been a lot better with a small shelf or rest like the Peltonen Sissipuukko sheaths have and a minor design change here would have been desirable. This is a knife I will be bringing with me a lot for shorter trips and day hikes as it fits quite well with the needs I have then. And the price, currently under 50€, makes it a fantastic choice even if you are not on a tighter budget. It performs well above its price, as seems to be a tradition with Mora Knives even today.